1. 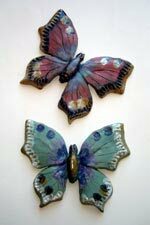 Butterfly modelled in smooth clay. 3. Herring Gull designed by Tracy. 5. This design replaces another bat mould that has worn away. 6. Master copies placed in box frame cases to create moulds. 7. High density dental plaster mixed with water. 8. Mixture carefully poured into each box mould. 9. Each piece is completely covered. 10. Mask and gloves are worn for safety. Moulds left to dry. 11. Once the original is removed, mould must dry out for a week. 12. Liquid clay (slip) is poured into the mould and left for a few hours. 13. Slip is drained from mould and then allowed to set over night. 14. The casts are fitted with hanging brackets, then removed. 15. 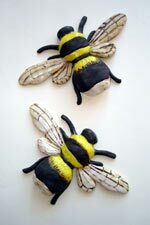 Once the piece is bisuit fired it can be glazed . 16. A mixture of stains, oxides and stoneware glazes are used. 17. Bees are placed in the kiln. 18. Butterflies are placed above. 19. The work is fired to 1260 degrees. 20. The kiln is emptied when cool.